"Listen! Listen to the waves! Listen to the god! He is speaking to us, and he says, We shall have no king but from the kingsmoot!" 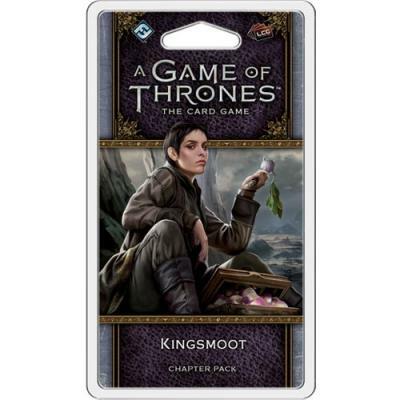 Kingsmoot is the third Chapter Pack in the Flight of Crows cycle. A kingsmoot has not been called in hundreds of years. But in the Iron Islands, the tide is changing with the mysterious death of Balon Greyjoy and the sudden return of Euron Crow\'s Eye. The Drowned God roils in his watery halls, the ironborn return to the old way, and the first kingsmoot in centuries has been called. Kingsmoot offers brand-new cards for the eight factions of A Game of Thrones LCG. As the story of the cycle continues to follow the events of A Feast for Crows, you\'ll see characters such as Ramsay Snow, Raff the Sweetling, Jhiqui, and Darkstar entering the game, alongside two new neutral Brotherhood characters. As the bestow keyword gains strength, other cards reward you for forging alliances between factions - but no matter who you fight for, you\'ll find the cards you need at the Kingsmoot!